Talk about keeping things on the light side recently! I hope you all aren’t craving more in depth recipes because for the time being we’re keeping things easy breezy over here! 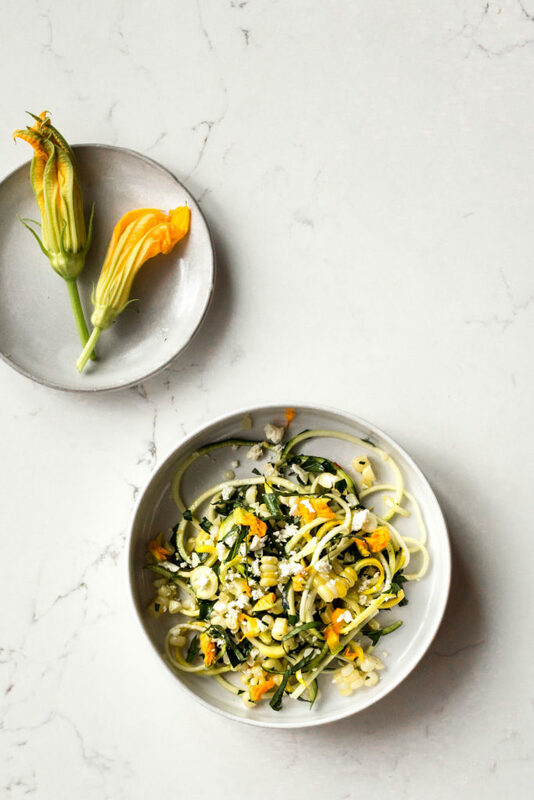 This zucchini salad with corn, squash blossoms and feta is perfect served alongside your favorite summer BBQ items. We brought this salad to a friend’s birthday Sunday evening and it was enjoyed alongside some grilled steaks. It’s light and refreshing but still packs a lot of flavor. In fact, folks loved it so much that I made it again so I could photograph/blog about it. The second time I made this salad we served it as a side dish to a simple chilled cucumber soup. Both Taylor and I love this salad so much because it uses so much of the summer bounty that we’re harvesting right now. This is the kind of salad I dream about in the dead of winter when summer feels like a million miles away. I hope you all enjoy this dish as much as we do. If you can’t get your hands on squash blossoms you can simply leave them out. Cook the corn in a large pot of boiling water for 3 minutes. Remove from the water and set aside to cool. In a small dry skillet over medium heat, toast the sunflower seeds until golden brown. About 3-5 minutes. Shake the pan often to avoid burning. When the corn is cool enough to handle cut the kernels from the cobs and place in a large bowl. Add the zucchini,, summer squash, scallions, herbs, squash blossoms (if using) olive oil, red wine vinegar and crushed red pepper flakes. Toss until everything is mixed well together. Top with the feta and toasted sunflower seeds and season to taste with salt and pepper. Looks delicious! I’ve never heard of squash blossoms, how pretty! Made this last night for a dinner party and it was a big hit. I don’t have a spiralizer so I used a mandoline with julienne blade with excellent results. This recipe is all about the quality of the ingredients – all the vegies need to be super fresh. It’s worth searching for goat’s milk feta since it is much more subtle than sheep’s milk feta that I normally buy. Sheep’s milk feta might overpower everything else. I didn’t add sunflower seeds – there were already enough flavors and textures that they didn’t seem necessary. Just like Andrea, I served it along side grilled steak. Perfect match on a hot day!